◎Much delayed by lack of funds, shortage of materials, and skilled workmen. 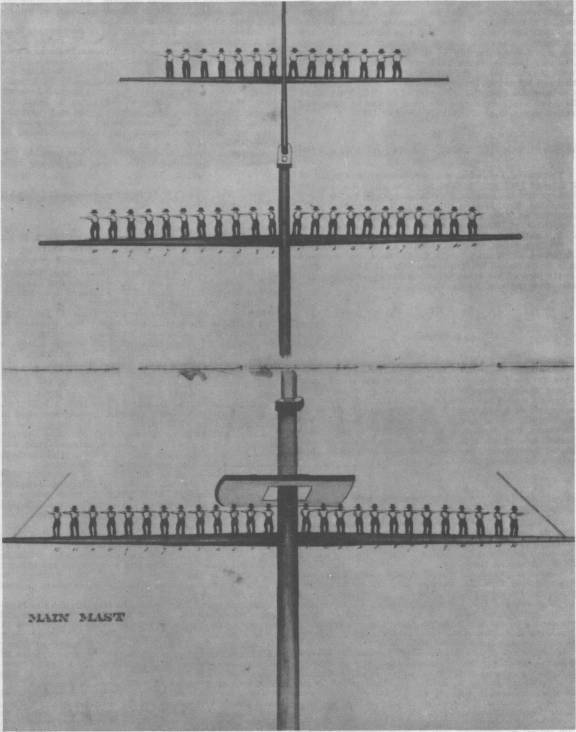 ↑Illustration for manning the yards, photographed from Watch, Quarter and Station Book, Ship-of-the-line Columbus. Illustrations were in color, drawn by an unnamed ship's yeoman, in 1847. ◎Mediterranean Sqn 1820-1821 (flagship). Receiving ship, Boston, 1833-1842. 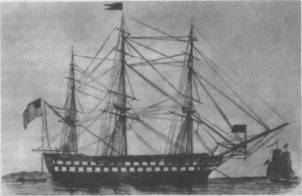 Mediterranean Sqn 1842 (flagship). Brazil Sqn 1843-1844 (flagship). Far East 1845. First visit to Japan, 20 Jul 1846. Laid up 1848. ↑Warships of the sailing navy. Chromolithograph by Armstrong & Company, after an 1893 watercolor by Fred S. Cozzens, published in "Our Navy -- Its Growth and Achievements", 1897. 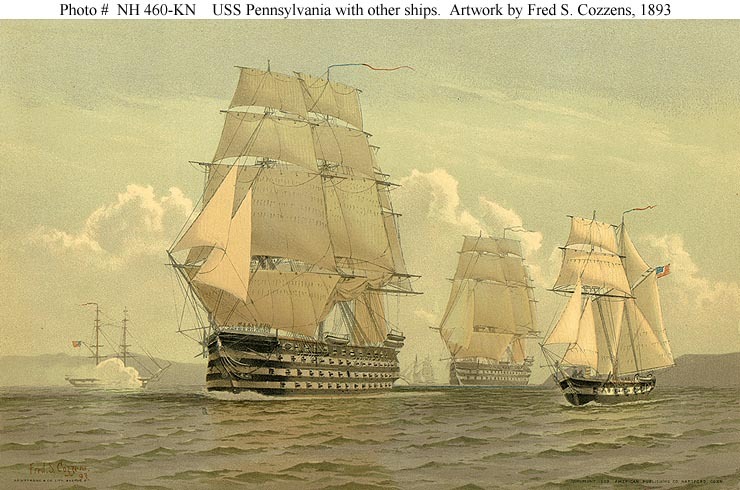 Ships depicted are from different eras, and are identified by the artist as (from left to right): U.S. Brig Enterprise, firing a salute; U.S. Ship of the Line Pennsylvania; U.S. Ship of the Line North Carolina, mis-labeled by the artist as South Carolina; and U.S. Brig Hornet. The vessel under sail in the far center distance is not identified. Collection of Captain Glenn Howell, USN, 1974. U.S. Naval Historical Center Photograph.